Colin Jones hits a 3-point shot for Cannon County in the fourth quarter. 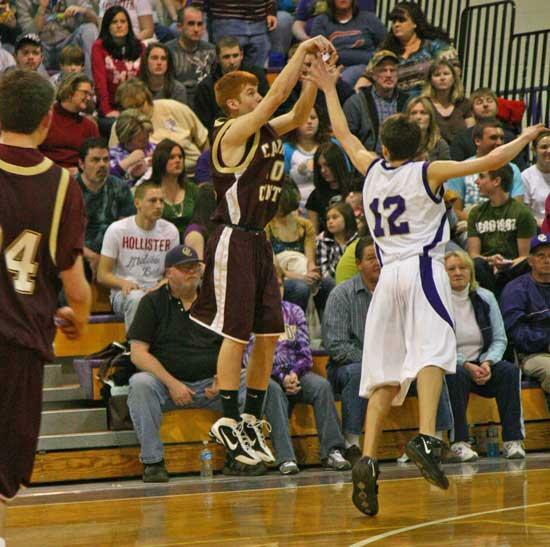 COALMONT — The 2009-2010 basketball season came to an end here Saturday night for the Cannon County Lions as they lost in the closing seconds to Grundy County. The Yellow Jackets' Dakota Fults scored with 1.2 seconds remaining in the game to lead Grundy County over Cannon County in Region 4-AA action. The Yellow Jackets, the winners of the 7-AA district championship, took a 16-15 lead over the Lions at the end of the first quarter. Cannon County fell further behind at the half, 32-28. The Lions continued to battle hard in the third, and trailed 44-39 heading into the final period. Refusing to go down without a fight, the Lions clawed back in the fourth to tie the game at 59, only to see victory slip away at the end. The Lions finish the season with an 18-12 record. SCORING: Justin Davenport 19 points, Jared Nave 13, Cody Ruehlen 10, Colin Jones 8, Andrew Woodin 7, Ethan Womack 2.